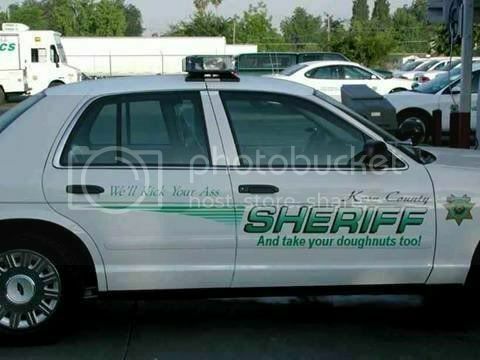 The Kern County, California, Sheriff's Department orders plain white patrol units and has the graphics applied locally. In this case, what they ordered was not quite what they got. This is one of the few times that the charge of "photoshop" is legit. I saw that picture years ago without the "doughnuts" tagline on it. Many moons ago, when the "baby on board" yellow signs were popular, I was working the street and my wife got a cool idea. She converted a baby on board sign to say, "Prisoner on Board". I got a lot of laughs from folks that pulled up beside me and noticed it in the rear window.